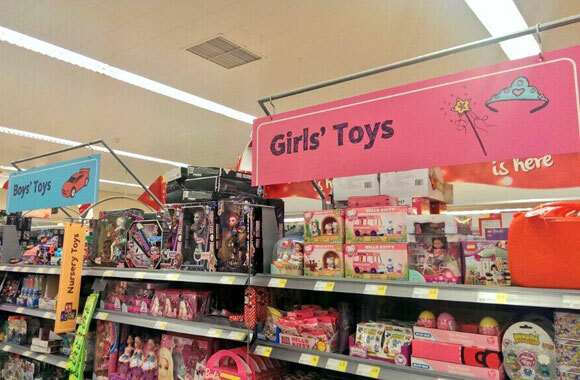 Asda – why are you still using ‘boys’ and ‘girls’ signs? In the three years that Let Toys Be Toys has been up and running we’ve had an overwhelmingly positive response from retailers. Fourteen major UK retailers, including Tesco and Sainsbury’s, have engaged positively with us and have agreed to remove ‘Girl’ and ‘Boy’ signs from toy aisles. Asda however, has yet to respond. We’re delighted to see the end of ‘boys’ and ‘girls’ categories in the major retailer’s online store, as well as clearer, inclusive signage in stores. Hai Tiet is the man behind US online toy retailer Woozy Moo, but his background isn’t in the toy industry. He explains why he thinks running an inclusive toy store is an important way to combat gender inequality. It’s great to see that one of the largest retailers in the US, Target, have acknowledged customer concerns and decided to move away from gender based signs. You may remember we met with Toys R Us in September 2013 when they committed to a more inclusive approach to toy marketing. We’ve certainly seen improvements since then, but we still have some questions over their timescale for change. Pink and blue – who cares? Despite a promise last year to change their toy signage Morrisons came out of our pre-Christmas survey as the worst culprit for using gender to sell toys. We’ve written to Morrisons, asking them to reconsider their toy signs. John Lewis have responded to our letter querying their use of boys and girls categories on their website.